Chemical feed systems can be used for e coli bacteria, coliform bacteria, sulfur bacteria, and iron bacteria treatment, and just about all other organic issues. The chemical feed pumps are self-priming, making setup and maintenance as easy as possible. 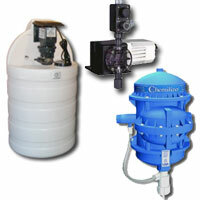 We carry complete line of chlorine water treatment products and accessories including chlorine pumps, retention tanks, chemical solution tanks, mixing accelerators, and flow switches. 15 Gallon Natural Chemical Solution Tank for use with Chemical Feed Systems.